Carolina captain Eric Staal realizes trading is all a part of the business, but knows it's tough on the families involved. "Any time there are trades it's tough," Staal said. "But that's part of the business and everybody knows that. I think for our family and wives, sometimes it's a little bit harder, but for the guys in the room you understand that's part of the business and part of the NHL. But if the right moves are made to make us better for this year and next year, we're for it. Hopefully we can get back to where we need to be." Jim Rutherford, who has presided as general manager of the franchise since 1994, still finds it difficult dealing players he's come to admire. He expects to have a similar feeling prior to the March 3 trade deadline this year. "It's very difficult for me personally because some of the players who will end up being moved are guys that won a Stanley Cup here and you get a special bond with those players, really, for the rest of your life," Rutherford said. "You'll always remember what they did toward contributing to winning a Stanley Cup and, in some ways, in as much or as little as they can with management, they become friends. So it's difficult and a disappointing time of the year to be moving players instead of just trying to get a player or two to make a run at the Cup. "At the same time, I've been in this position before where we've had an off year and, quite frankly, it was the best thing that happened to us because some of the things we did led to us winning a Stanley Cup in a very short period of time." It doesn't surprise Carolina Hurricanes General Manager Jim Rutherford one bit that a few big names already have changed addresses as teams look to get the jump with some early wheeling and dealing in anticipation of the Olympic roster freeze. While the NHL trade deadline is March 3 at 3 p.m. ET, a trade freeze is in place during the Winter Olympic break -- Feb. 13-28. That leaves only three days for general managers to swing deals prior to the deadline and, as a result, many teams would prefer to get something done prior to the Games in Vancouver. That certainly was the case with Toronto GM Brian Burke Sunday. Burke shook up the makeup of his dressing room with the acquisition of defenseman Dion Phaneuf as part of a seven-player deal with Calgary and then swapped goalies with Anaheim to get Jean-Sebastien Giguere. The following night, Calgary GM Darryl Sutter made his second big deal when he traded forwards Olli Jokinen and Brandon Prust to the Rangers in exchange for Ales Kotalik and Christopher Higgins. Rutherford knows all about pulling the trigger on a huge deal that would ultimately play a vital role to a Stanley Cup run. He did it just prior to the 2006 Winter Games in Torino, Italy. "I think there's an advantage to getting a player sooner than later because I've experienced that in the year we won the Cup (in 2006)," Rutherford told NHL.com. "The player most sought-after was Doug Weight. Everybody was going after him but we jumped in early and made the deal and got him out of the marketplace. "We got him in here to get adjusted to our team and he made a difference," Rutherford continued. "We also got (Mark) Recchi at the deadline and he also helped." The centerpiece of Rutherford's multi-player deal with the St. Louis Blues on Jan. 30, 2006, was Weight, who was acquired with left wing Erkki Rajamaki in exchange for forwards Jesse Boulerice, Mike Zigomanis and Magnus Kahnberg and Carolina's first-round pick in 2006. As a member of the Hurricanes, Weight, who would represent Team USA in the 2006 Winter Games in Torino 12 days after his trade to Carolina, chipped in with 16 points in 23 playoff games. He missed Games 6 and 7 of the Stanley Cup Final due to a shoulder injury suffered in Game 5. But despite losing Weight, the 'Canes managed to defeat the Edmonton Oilers en route to the franchise's first Stanley Cup. Recchi, who scored 7 goals and 16 points in 25 playoff games in '06, waived his no-trade clause to play for the Cup-contending Hurricanes. 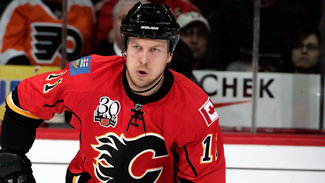 He was dealt from Pittsburgh for Niklas Nordgren, Krystofer Kolanos and a second-round pick in the 2007 Entry Draft. "From a seller's point of view, we would rather do it sooner than later," said Rutherford, who might be inclined to make some pre-Olympic deals since his team stands 14th in the Eastern Conference with 45 points. The 'Canes have picked it up of late, winning four of their last five games to move within 12 points of the eighth seed in the Eastern Conference. "We're playing every game as hard as we can," Rutherford said. "We have to uphold the integrity of the League and despite the fact we didn't have a very good first half, everybody is fighting for positions and playoff spots, so until we're mathematically eliminated, we're not going to say we're eliminated from the playoffs. We'll play as hard as we can and, in the meantime, move some players around." Unlike the 2005-06 campaign, when Carolina was in the thick of the playoff hunt, the team is on the outside looking in this season. It certainly won't stop Rutherford from working the phones in an attempt to upgrade his team in certain areas. "Ideally, what we would like to do is get young assets, preferably draft picks over younger players," Rutherford said. "I'm not looking at this as reshaping our team at this point in time. It's more about getting as many young assets as we can and then reshape the team accordingly in the offseason." In particular, Rutherford might be inclined to deal a few of his veterans, who could offer immediate assistance to a playoff-contending team. There are several on the current roster whose contracts expire after this season, including forwards Matt Cullen, Scott Walker, Ray Whitney and Stephane Yelle, defensemen Niclas Wallin, Joe Corvo and Aaron Ward and goalie Manny Legace. "I don't have to make calls -- everybody knows where we are in the standings so I'm getting calls," Rutherford said. "The phones started ringing after the Christmas freeze and then, really, over the last week when things really got accelerated where I'm getting a lot more calls since teams are more anxious to make moves." Rutherford did stress that he'll do what's best for the development of his young players -- a list that includes Brett Carson, Patrick Dwyer, Jiri Tlusty, Drayson Bowman, Zach Boychuk and Jamie McBain. "They've got a little bit of time with us this year, but we've positioned ourselves to transition into a younger team next year," Rutherford said. "That was our plan all along, even if we won the Stanley Cup this year. It's just that we had a bad first half and we're accelerating that now, so if we get an opportunity to get some of those guys more games and experience, we'll do that down the stretch."